Polyplexes between Salmon DNA and non-modified hyperbranched poly(ethyleneimines) of varying molar mass, i.e., PEI(5 k) with 5000 g/mol and PEI(25 k) with 25,000 g/mol, and modified PEI(5 k) with maltose units (PEI-Mal) were investigated in dependence on the molar N/P ratio by using dynamic light scattering (DLS), zeta potential measurements, micro differential scanning calorimetry (μ-DSC), scanning-transmission electron microscopy (STEM), and cryo-scanning electron microscopy (cryo-SEM). A reloading of the polyplexes can be observed by adding the unmodified PEI samples of different molar mass. In excess of PEI a morphological transition from core-shell particles (at N/P 8) to loosely packed onion-like polyplexes (at N/P 40) is observed. The shift of the DSC melting peak from 88 °C to 76 °C indicates a destabilization of the DNA double helix due to the complexation with the unmodified PEI. Experiments with the maltose-modified PEI show a reloading already at a lower N/P ratio. Due to the presence of the sugar units in the periphery of the polycation electrostatic interactions between DNA become weaker, but cooperative H-bonding forces are reinforced. 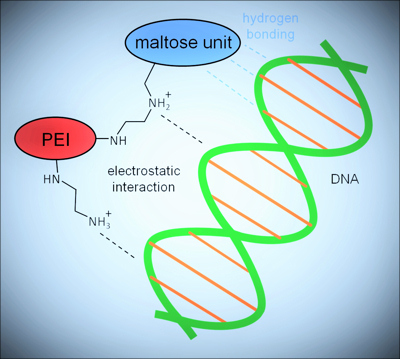 The resulting less-toxic, more compact polyplexes in excess of the PEI-Mal with two melting points and well distributed DNA segments are of special interest for extended gene delivery experiments.